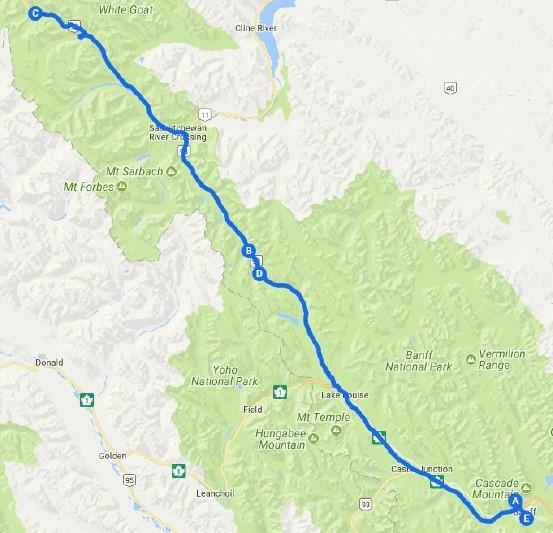 This tour begins bright and early west on the Trans-Canada Highway through the Bow Valley Corridor of Banff National Park along the Bow River. Mountain peaks such as Mount Rundle and Castle Mountain flank the road. Our drive will take us past the Valley of the Ten Peaks, including Moraine Lake, as well as Lake Louise and Louise glacier. From here we’ll continue Northwest on the majestic Icefields Parkway with a stop at Peyto Lake, a famed turquoise glacier-fed lake. During the summer, significant amounts of glacial rock flour flow into the lake, and these suspended rock particles give the lake a bright, turquoise color. We will stop long enough to make the short walk to the lookout area and get some breathtaking photographs of the lake, the surrounding mountains and wilderness. As our driving tour continues, we’ll travel past Num-Ti-Jah Lodge situated on picturesque Bow Lake in Jasper National Park. Note that this is a good stopping point for the return drive. Expansive views continue as we make our way to the Columbia Icefields Centre and Athabasca Glacier. Your Icefields Glacier adventure begins with a ride on an all-terrain Ice Explorer, a massive vehicle specially designed for glacier travel, to a place where you can walk on, feel and drink from the huge glacier. This thrilling trip with an experienced driver-guide will share a wealth of fascinating information about glaciers and their impact on our environment. A buffet lunch at the Columbia Icefields Centre is included as part of our tour. The tour officially ends after the explorer tour and will depart shortly thereafter.Participants are free to return with the tour leaders, or “peel off” during the return trip to visit sites in and around Banff. Dress: Weather conditions can change rapidly. Recommend you dress in layers. Closed toe shoes or boots with a good grip; jacket and/or sweater are advisable.